In the UK there are over 200,000 hospital visits each year due to heart attacks: that’s 1 every 3 minutes. However, the outlook for surviving heart attacks and recovery is improving. In the 1960’s more than 7 out of 10 heart attacks in the UK were fatal. These days at least 7 out of 10 people survive. There are an estimated 1 million people alive in the UK today who have survived a heart attack. 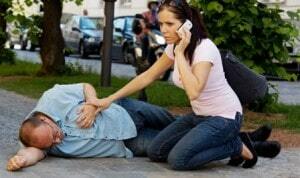 A cardiac arrest is when a person’s heart stops pumping blood around their body and they stop breathing normally. If you are in cardiac arrest you will be unconscious and need to receive CPR immediately. Use a defibrillator and call an ambulance to give them a chance of recovery. When the ambulance team arrive they will do a test called an electrocardiogram (ECG) to see if a heart attack is causing your symptoms. The involves attaching sticky electrodes on your arms, legs and chest. These are wired to a machine to record the electrical impulses in your heart. It’s these electrical impulses that make your heart pump. The paramedics may be able to diagnose if you’re having a heart attack from the specific changes that are seen on your ECG results. However, this must be done quickly so it doesn’t hold up your transfer to hospital. Paramedics are trained to treat those suffering from heart attacks. They will quickly transfer you to hospital for treatment for the type of heart attack you have had. Each minute is vital to preventing long-term heart damage. If you have a heart attack it is vital to have treatment as soon as possible. Early treatment can restore the blood flow to the damaged part of your heart muscle and can save your life. It can also limit the amount of permanent damage to your heart muscle. primary angioplasty – a procedure to re-open the blocked coronary artery and usually by inserting stents (tiny tubes) to help keep the narrowed artery open. thrombolysis – medicine which dissolves the blood clot blocking the coronary artery. Unfortunately having one heart attack does increase the risk of having another. However this risk is greatly reduced with the correct treatment. And, if you take the medicines your doctors have prescribed for you and follow a healthy lifestyle, you can significantly reduce your risk. If you have had a heart attack you are usually referred to a cardiac rehabilitation service if there is one locally. Here you will receive specialist advice, support and physical activity.